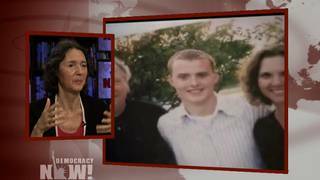 U.S. Army Subpoenas Independent Journalist to Testify in Court-Martial of War Resister First Lt. Ehren Watada | Democracy Now! independent journalist and radio producer. an independent journalist who has covered the Middle East extensively. He publishes his reports on a blog called DahrJamailIraq.com. AMY GOODMAN: We turn now to the court-martial of First Lieutenant Ehren Watada to become the first commissioned officer to refuse his orders to deploy to Iraq. It was June 22nd, 2006. He has been court-martialed. The pretrial hearing begins Thursday. Watada faces one charge of missing troop movement, four counts of conduct unbecoming an officer. Each of the later four charges relates to Lieutenant Watada’s public explanations of his refusal to deploy to Iraq. The U.S. Army has subpoenaed independent journalist Sarah Olson to testify at the upcoming hearing. Sarah Olson interviewed Watada last May. The Army says statements he made during Olson’s interview constitute one charge of conduct unbecoming. The Army has placed another journalist, Dahr Jamail, on the prosecution witness list. If convicted of all charges, Lieutenant Watada faces six years in prison, four of which would be for speaking to the press. Well, Sarah Olson and Dahr Jamail join us now from San Francisco. We welcome you both to Democracy Now! Let’s begin with Sarah Olson. Can you tell us what it is the government is demanding that you do? SARAH OLSON: The government has subpoenaed me to testify at the court-martial of Lieutenant Ehren Watada, as well as the pretrial hearing this Thursday and Friday. They have asked me to appear. They have asked me to take the stand and essentially verify my reporting. They want to have me say that what I reported is accurate. The problem with that, as I see it, is that the Army is asking me to participate in the building of a case and the prosecution of political speech. I feel that that would threaten press freedom and chill dissenting voices and free speech, political speech in the United States. AMY GOODMAN: And how did you learn that you were being required to go to this hearing and testify? SARAH OLSON: Well, I was actually first notified that I was on the Army’s witness list back in July, when the Associated Press and Reuters started emailing me. Later on, I was formally served with a subpoena just a couple weeks ago, and someone showed up at my house in Oakland several different times and served me with a subpoena to appear both, again, at the pretrial hearing, as well as the court-martial. AMY GOODMAN: And that pretrial hearing is January 4th? SARAH OLSON: It is. January 4th and 5th. AMY GOODMAN: What are you planning to do? SARAH OLSON: Well, I can’t really talk too much about my legal strategy right now, but what I think is very important is that there are a couple of different issues, a couple of different problems with the Army kind of dragging journalists into a military court and asking them to testify against their sources. I think it’s my job as a journalist to report the news. It’s not my job to participate, again, in the Army, in the military or government prosecution of political speech. I think when journalists do that, they really risk being turned into kind of the investigative arm of the government, really being seen as the eyes and ears of the military and the government. It really threatens to erode kind of that separation between the press and our government. I think that this is particularly ironic, because the Army is, again, asking me, a journalist, to build the case against military personnel speaking to the press, against dissenting voices in the media. And I think, you know, kind of the final thing that I find really alarming about that is that it really does threaten to kind of eliminate those voices from the media. What kind of future war resisters would agree to speak with me or with other journalists if they thought that it was reasonable that they would be facing very high prison sentences, four years in prison, for explaining, you know, the reasons for their opposition to the Iraq War? And I think that the debate around public issues, kind of current events, and in this case the Iraq War, is really an essential thing that the media provides. It’s, you know, the informed citizenry really is kind of the lifeblood of democracy, and without the media functioning as, you know, really holding kind of all — you know, asking the important questions and really kind of representing every viewpoint, you don’t have that informed debate, and I think that those are the things that the Army is really threatening and really challenging when they’re asking me and other journalists to come into court and to testify against my own source in this case about political speech. AMY GOODMAN: We’re talking to Sarah Olson, independent journalist who’s been subpoenaed to testify at the pretrial hearing leading to the court-martial of Lieutenant Ehren Watada. We’re also joined by Dahr Jamail. Dahr Jamail, can you talk about your situation in regards to Ehren Watada? DAHR JAMAIL: I was contacted by the Army several months ago and notified that I was on the prosecution witness list. I then decided that it would be in my best interest to hire an attorney, rather than contacting the Army directly. And I was aware of the fact that I was put on the witness list, because I wrote an article about a speech that I watched Lieutenant Watada give at a Veterans for Peace national convention in Seattle this past August. And it was some of that speech is also being used by the prosecution to try to tack on some extra years to his sentence. AMY GOODMAN: What are your plans? What are you going to do? You’re not quite in the same situation as Sarah Olson. DAHR JAMAIL: I have not been subpoenaed yet. It’s obvious that I’m not going to be subpoenaed for the pretrial hearing. I still might be subpoenaed for the actual court-martial trial. In the interim, I think that it’s important to continue to bring attention to the case and also to — for two reasons: for what Lieutenant Watada has said that the Army obviously finds so threatening, and also because of the situation it puts us in as journalists, that this should be a wake-up call, a shot over the bow for journalists all across the country, not just independent journalists, but anyone, because, as Sarah said, if we as journalists can’t interview people without the threat of then being used as a tool of the prosecution against them in a court of law at some point, especially in this case with the military as civilian journalists being brought into a military court to do that, I think that’s a very worrisome situation. The other thing that I think is important to remember when we talk about this is, what did Ehren Watada say in this speech in Seattle that the Army feels so threatened by? And I believe that it’s because he really laid out a blueprint for a GI resistance movement in this country. He talked about the very extreme need of economic support for families of people who decide to resist this illegal, unjust and immoral war, and if people across the country start to take that upon themselves as communities and bring these families in and start to support them as Lieutenant Watada suggested, then we will have a GI resistance movement in this country, and that’s something the Army is very, very much, I think, very concerned about and very afraid of. And they should be. AMY GOODMAN: Dahr Jamail, independent journalist, well known for his reporting from Iraq. Sarah Olson also interviewed Ehren Watada. She has been subpoenaed. So you’re going to go to the hearing, but not cooperate, Sarah? SARAH OLSON: Well, again, I can’t quite talk about kind of the legal strategy that we’re going to employ. But I certainly hope that the Army can be convinced — for example, everything that I did with Ehren Watada, Lieutenant Watada, was recorded for radio. I certainly hope that the publicly available kind of radio recordings will be sufficient for the Army to do what they do without kind of, you know, again, bringing journalists into the military court to testify against their own sources. It’s kind of the — the very idea of being asked to cooperate with a case that really seeks to prosecute political speech is what I find so offensive. AMY GOODMAN: Sarah, where is the rest of the media on this? How much support are you getting, both in terms of people coming to your defense, but also coverage of the situation? SARAH OLSON: You know, it’s interesting. I mean, I think that journalists are rightly concerned about this. It hasn’t gotten a significant amount of media coverage yet. I certainly hope that people will continue to cover it, will continue to look at, you know, why is this important. I think it’s an interesting case, because this is not something where I’m being asked to reveal a confidential source or, you know, talk about unpublished material. It’s really — it’s new to be asked to just kind of, you know, present the Army’s case, to really be the heart and soul of their prosecution in this case of his political speech. And so, I think people are a little slow to understand that this really is something new and really is very alarming. But people are certainly — have been very supportive, and I think, with any luck, they’ll continue to do so. AMY GOODMAN: Dahr Jamail, finally, we only have a minute, but given your extensive reporting in Iraq, I just wanted to get your reaction to the execution of Saddam Hussein this weekend. DAHR JAMAIL: I think the timing of doing it on the day of Eid al-Adha, the day acknowledged on December 30 by the Sunnis — of course, this being written off by the Shia-dominated government saying that it’s against Iraqi law to execute someone on Eid al-Adha, and for Shias, that is on the 31st, so making a very clear statement now that Iraq is essentially a Shia-dominated Shia state now, sort of a snub at the Sunni population there. And I think that, coupled with the fact that the trial was a wash, it was a kind of a spit in the face of international law, like the whole entire occupation and invasion were, as well, is really par for the course of what we’ve come to expect with this immoral, unjust, disgusting situation that keeps dragging on with no end in sight. AMY GOODMAN: Well, Dahr Jamail, I want to thank you very much for being with us, independent journalist, and Sarah Olson. And we’ll certainly continue to follow the case and what happens in the hearing and court-martial of Lieutenant Ehren Watada.